As parents, we love to see our kids smile and laugh, and we work hard every day to protect our children and keep them healthy. At LIC Dental Associates, we are dedicated to pediatric dentistry, and we invite patients to bring kids to our office frequently. We work with you and your child to create positive associations with dentists, dental offices, and dentistry technologies. 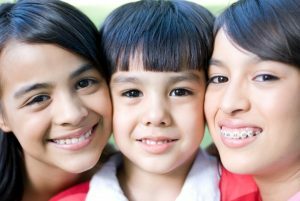 By getting your child accustomed to dental visits at an early age, we may prevent future fear or anxiety associated with dentistry, and best of all, keeping your child’s smile healthy at every stage of development increases the chances that they will have their natural teeth for a lifetime. By the age of one, most children have at least one or two teeth. We encourage patients to bring kids to see us after the first tooth erupts, or before their first birthdays. This initial visit is short, quick, and painless. Before your child develops teeth, you should keep their gums healthy by wiping them off with a clean, damp cloth after feeding. Another way to protect your baby’s developing teeth is to break the habit of sleeping with a bottle early. You may have heard of baby bottle tooth decay. This is one of the most detrimental oral health habits your baby could develop. As soon as your baby has teeth, you should begin brushing them twice a day with an ultra-soft bristled brush made for infants and a tiny (rice grain sized) amount of fluoride toothpaste. When your child has two teeth that touch, start flossing once daily. Building these habits for your child is one of the best gifts you can give them. When children begin to develop hand eye coordination, it’s time to start letting them try brushing and flossing on their own. We encourage patients to make tooth brushing and flossing fun activities. Play music for two minutes while the kids brush, or create a brushing and flossing chart where they can put stickers or check marks when they complete their oral hygiene routine. Whatever works for you and your child is great. Just remember to keep it fun! The first dental visit consists of a simple visual examination. Typically, the child will remain in your lap, as the dentist screens for signs of decay and developmental concerns, discusses oral hygiene at home, and develops a plan for continuing dental care. We’re always happy to answer questions, and demonstrate brushing and flossing with baby. At LIC Dental Associates, we’re dedicated to helping patients of all ages achieve and maintain healthy smiles. Contact us to schedule your child’s first visit, and let our team help your child on the road to a lifetime of healthy smiles.